In the past being a transcriber was difficult. The equipment was complicated to use and expensive. More often than not you would be working with audio cassette tapes, which meant the tapes would be shipped to you and shipped back, or you would pick them up in person, or work in an office. The audio quality was poor, tapes would get get jammed or break rather easily, and the computers we used were clunky and slow. Now from the comfort of your own home you can transcribe. This article lays out all of the equipment a transcriber will need. Get a good pair of headphones. The one above is a great choice as it’s specifically designed for transcription. I also really like the Sony MDR7506 Professional Headphones. They are studio monitors designed for audio professionals, but reasonably priced at under $80 a pair. In my opinion, the Sony headphones are worth the investment. They are durable and well-constructed. Occasionally I’ll get very difficult audio, even audio where a reporter is using a hidden microphone. 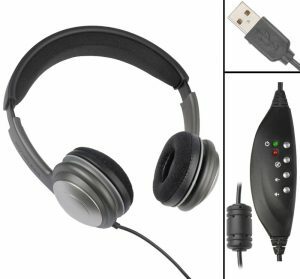 The audio on those files can be extremely difficult to hear, and I’ve compared the audio using these headphones to a regular pair of headphones and the clarity difference was pretty amazing. I could hear words and conversations that were completely unintelligible on a regular pair of headphones. The most basic and intuitive software out there is NCH’s Express Scribe. It is cheap, runs very smoothly, and is very easy to use. But it does not support true time code transcription. If you already own Express Scribe or desire a software with more features then FTW Transcriber (discount code included) or Start-Stop Universal Transcription System are great additions to your transcription software library. An ergonomic keyboard is very important. It will save you a lot of wrist and forearm pain, which is inevitable for somebody who types a lot everyday. At first I found the ergonomic keyboards a little difficult to use, but you will adjust to the keyboard’s shape within a day or two, at most, and ultimately save yourself a lot of wrist & forearm strain. The key to avoiding wrist or forearm strain is keeping your wrists and forearm level while typing. If your hands are on an upward or downward plane this will inevitably cause strain in your wrist or forearms. I know some transcribers who absolutely refuse to use a foot pedal, but I cannot type without one. What the foot pedal does is it plays, rewinds, and fast forwards the audio or video while you’re typing. This way you don’t have to use your hands to rewind the audio or video while you type. A foot pedal for me is a big time-saver. I do not want to stop typing and grab my mouse and hit the rewind button, or even use a keyboard shortcut, as I don’t want to get my hands out of position while typing. 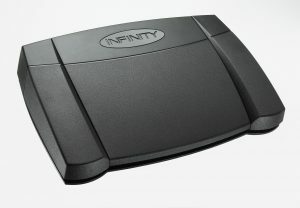 I use USB foot pedal by Infinity, it works with every computer and software I have. It’s responsive, versatile, and well priced. Everybody and every body is different, so you’ll need to find a chair that gives you neck, back & lumbar support. The mid-back office chair is a reasonably priced and very comfortable chair. To sum it up you need fives pieces of equipment to transcribe at-home, with many people already owning headphones, and a comfortable chair, the 3 additional items are well worth the investment: An ergonomic keyboard, transcription software, and a foot pedal. Also, since you are a self-employed transcriber these items are all tax deductible. Including these tax benefits, it’s well worth buying a dedicated headphones, office chair, and computer even if you already own them. Once you have this equipment you’re ready to get started. Now you need to find transcription work, which can be very difficult particularly in today’s ultra-competitive global environment. I will discuss how to get transcription work in a future article. For now I wish everyone good lucky & happy transcribing!